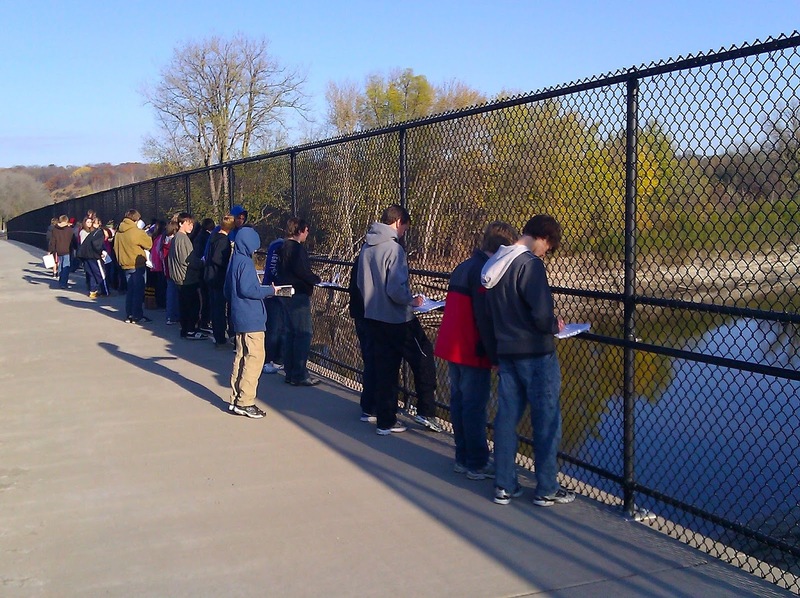 On October 28, Delano Middle School 8th Grade students traveled to the Henderson area within the Minnesota River Valley for our annual field investigation. 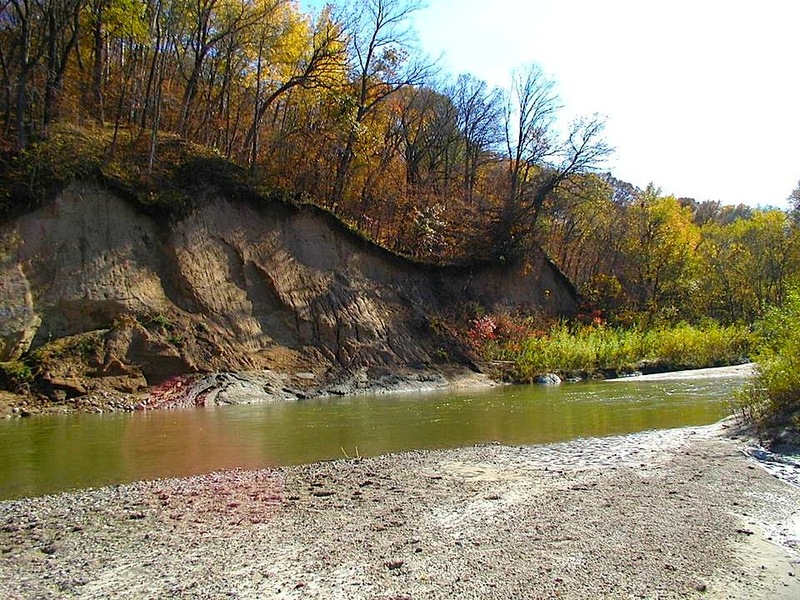 Our goal that day is to acquire the observations and evidences necessary to determine the geologic history of the Minnesota River Valley and the adjacent Rush River County Park. 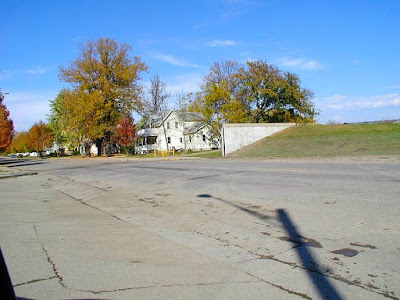 This post will be the first post of a series that examines and identifies the regions history. This post will focus on what the students saw, what they did and what was recorded in their student lab journals. 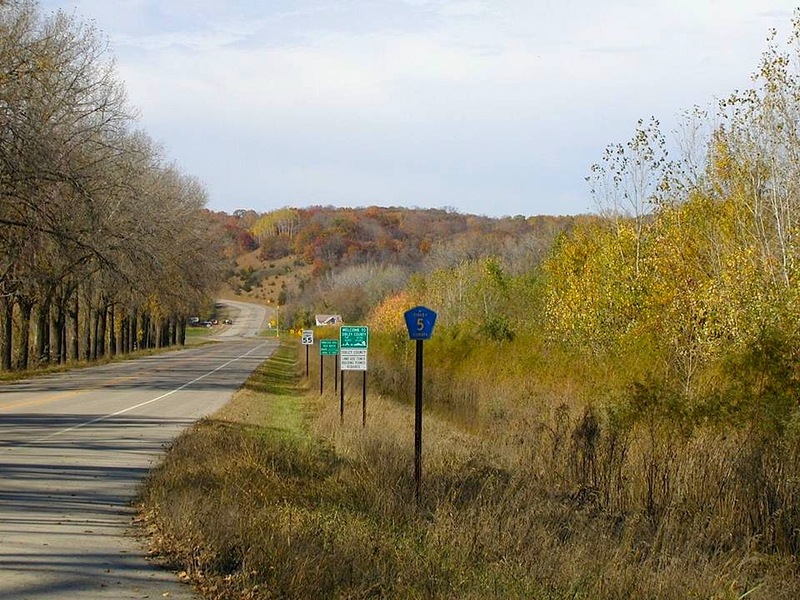 Our first stop of the day was the bridge that spans the Minnesota River at Blakeley, Minnesota. 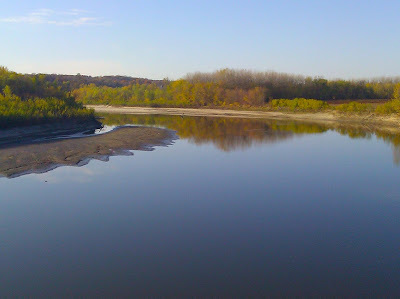 The day that we visited, the river was at 714.15 feet, making it the fourth lowest level recorded for the Minnesota River at this location. 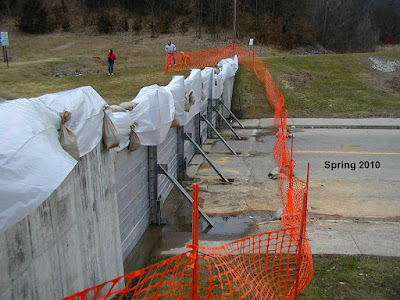 Levels lower that this are 701.00 ft. on 1/1/1950, 713.29 ft. on 11/16/2001 and 713.36 ft. on 10/11/2000. You can compare this to the all-time high crests of 740.08 ft. on 9/28/2010 and 739.65 ft. on 4/11/1965. Source: http://water.weather.gov/ahps2/hydrograph.php?wfo=mpx&gage=henm5&view=1,1,1,1,1,1,1,1. 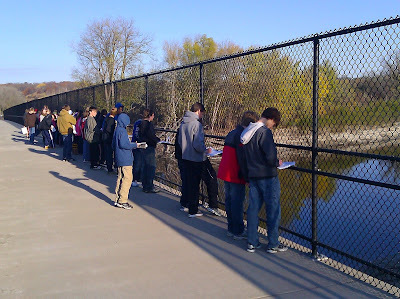 While on the bridge, students attempt to gauge the scale of the valley. How deep is the valley? How wide? At this location, the valley is almost two miles wide and 250 feet deep. In some locations, the valley is almost five miles wide and the same depth. Students have been asked to always question what took place to form what they are seeing. 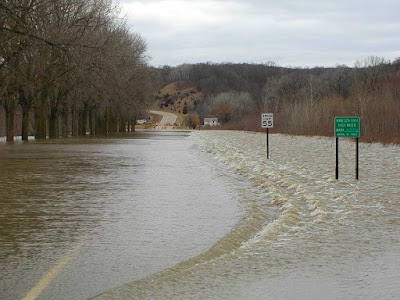 Very near where students get back on the buses, they are able to see a road sign that indicates past high water marks of the river. 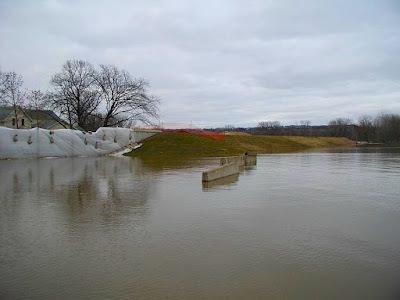 It becomes clear to students that the river floods periodically to very high levels, at this point, many students begin to assume that erosion by the flooded river would be enough to form the valley. 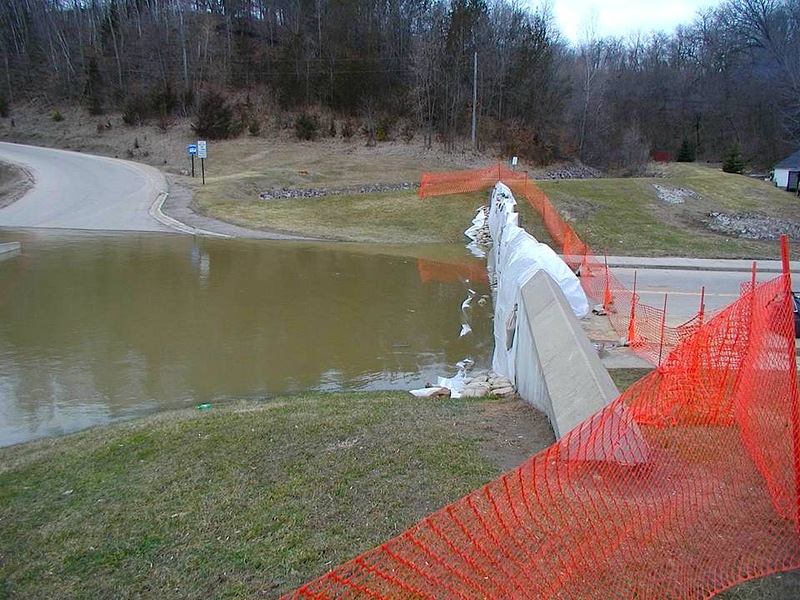 Pictures of the river in flood were taken in the spring of 2009 and 2010. 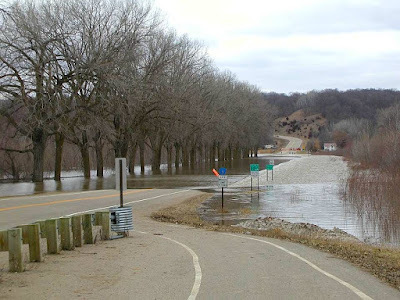 The second stop of the day is in the town of Henderson, still inside the Minnesota River Valley, at the flood gates that the city is occasionally forced to close. 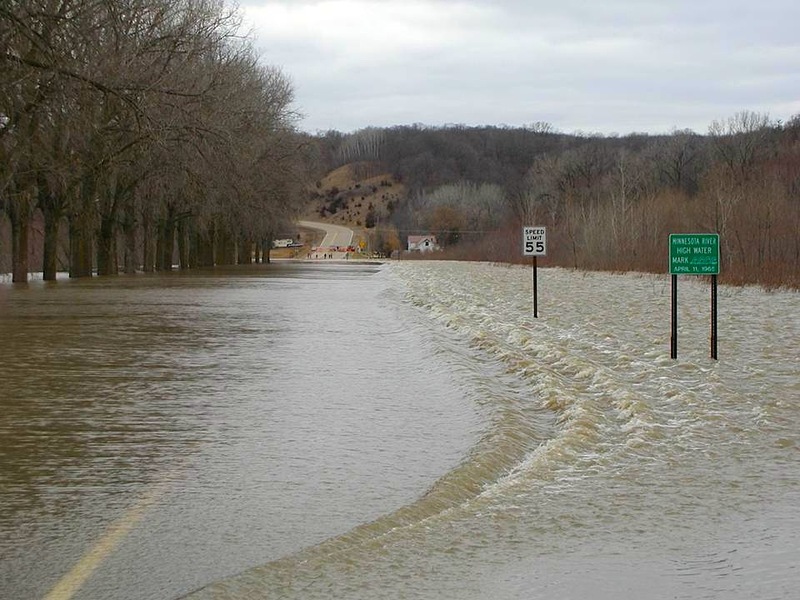 When the Minnesota River reaches 734 feet, the town closes itself off to protect the lives and property from the river. While at this stop, students again realize that the river floods to very high levels. When trying to determine what caused the valley to form, many students see the flooding river as a strong piece of evidence. From Henderson, our third stop is at the Rush River County Park, a short drive away. 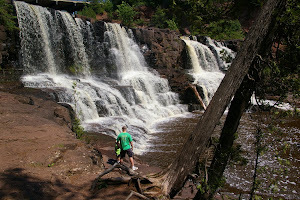 The Rush River is a small tributary to the Minnesota River, it flows primarily through farmland and it's watershed occupies parts of Sibley, Nicollet and McLeod counties. While at the park, students do a variety of activities designed to give them real world experience with several of our units. These units include Rocks, Water Systems, Erosion, among others. 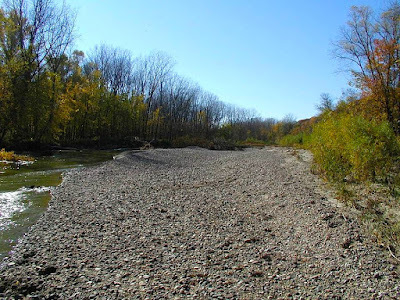 The majority of our time in the park is spent near the river on a point bar, an area of deposition where the river deposits all types of sediment. 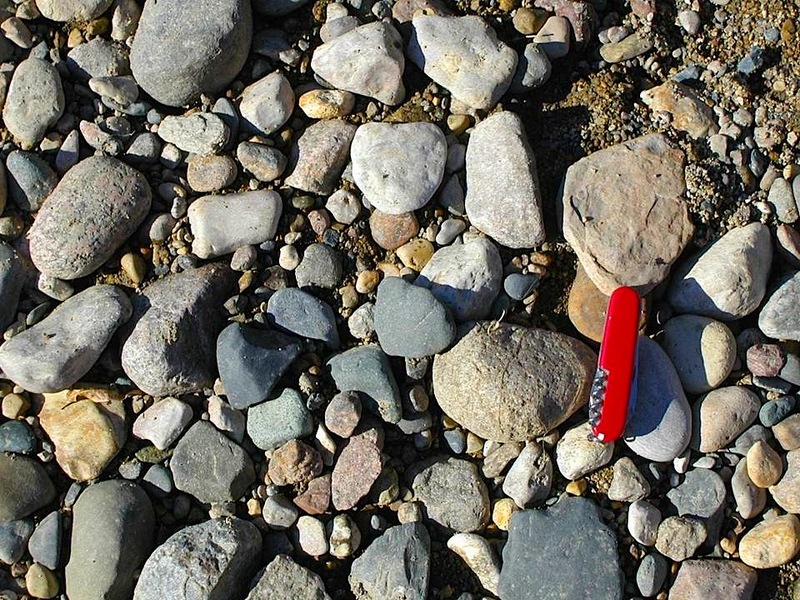 As students walk the point bar, one immediate observation made is that larger sediments are located upstream, while farther downstream the sediments get smaller. 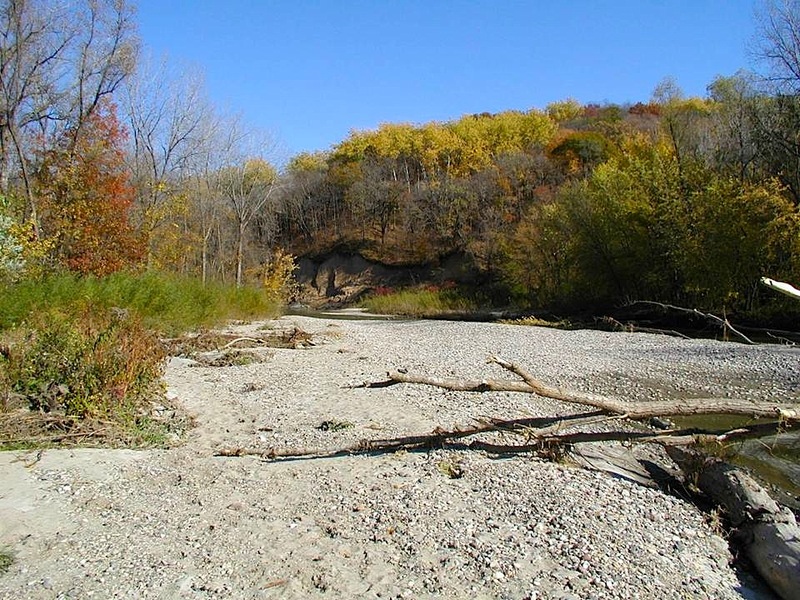 The picture on the top is indicative of upstream regions of the point bar, the picture on the bottom demonstrates downstream regions. 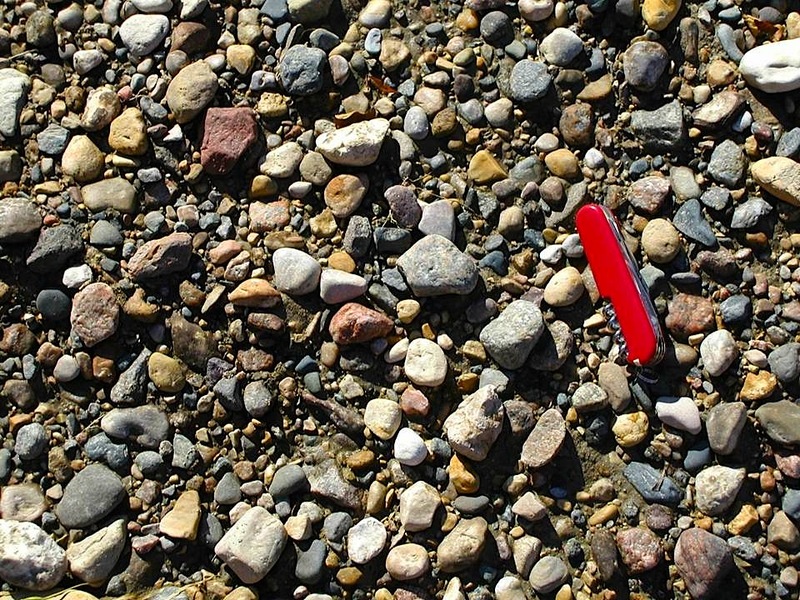 While walking the point bar, students begin to identify some of the rock types found. Students identify many igneous rocks like basalt, rhyolite, granite, gabbro and sedimentary rocks like limestone, sandstone and shale. We typically find several agates and occasionally find petrified wood. 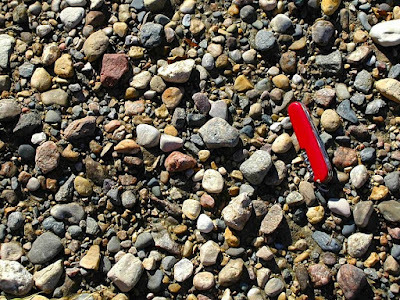 These rock types are not native to the region. Bedrock at this location is sedimentary in nature, though the bedrock is covered by glacial drift. 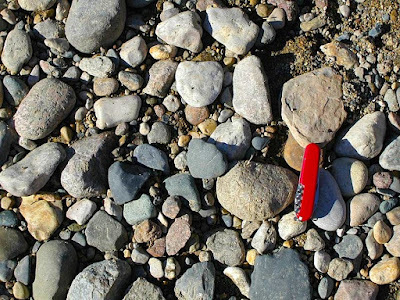 Students are asked to brainstorm how these non-native rock types could have been deposited at this location. Students generally generate a list that includes: water, wind, animals, and some think of the real depositional method of glaciers (we have not discussed glaciers at this point and will not for another month or so). Our last activity at the Rush River is to notice and draw the cut face (an erosional feature) found directly across the river. This particular feature is comprised of at least three different glacial advances and tills. The uppermost till is representative of a Northwestern source area or the Riding Mountain Provenance. The middle layer of till represents a Northeastern source area or the Superior Provenance. The bottom most layer of till represents a much older glacial advance. Back in the classroom at a later date, students will examine these different glacial tills that have been acquired from the Rush River County Park or immediate area. Students begin to realize why they only find the volcanic rocks of the Mid-Continent rift system in the middle layer of till and why the gray, Pierre shale is only found in the uppermost layer of till in the region. 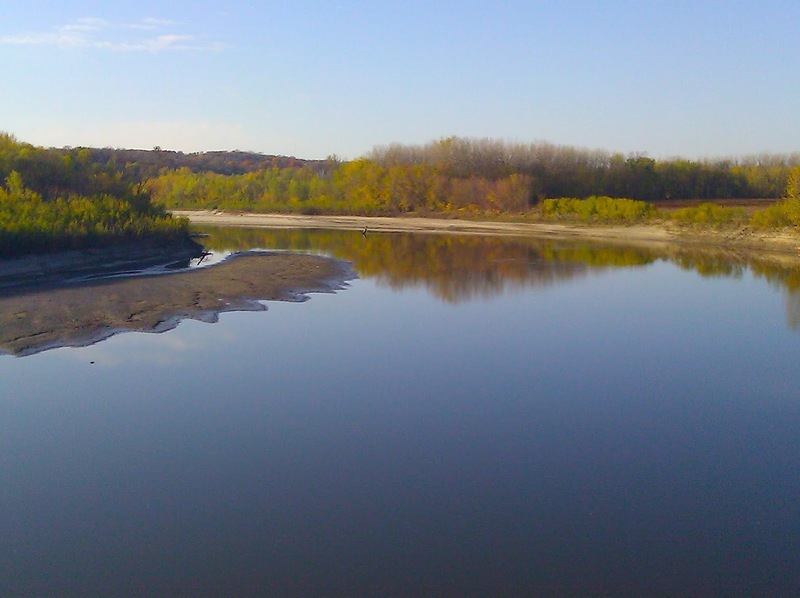 It's while examining these different glacial tills that students finally begin to realize the geologic story of the Rush River County Park and Minnesota River Valley. They also begin to realize how valuable their observations of the area are in determining the history of the region. In a later post, I'll go deeper into the glacial history of the area and how exactly the Minnesota River Valley formed.